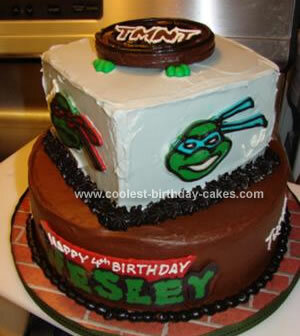 I made this Teenage Mutant Ninja Turtle Cake for a friend’s son. The cake board is covered with a brick-print scrapbook page, and then with clear contact paper and then edged with ribbon. Most of the decorations were made with candy melts. For the name plaque (my favorite part of the cake! ), I found a web site that had a TMNT font, typed the child’s name, and then printed it out as a mirror image using “advanced features” in the print setup dialog box of my computer/printer. I taped it underneath a piece of clear acetate, and then taped it to the inside curve of the cake pan interior. After carefully tracing it with candy melts, adding a red rectangle at the top, and cooling in the fridge, I peeled away the acetate. I piped on the white lettering. The character faces are done in a similar way, except you can work on a flat surface and you don’t have to reverse them when printing. I did the black outlines with piped frosting, after the candy melt portraits were finished. Also did a round circle of candy melts in the bottom of a small bowl (lined with wax paper) for the manhole cover. The “fingers” pushing up the manhole cover are fondant. White lettering was piped on. I also piped on shortened versions of the turtles’ names (Leo, Mike, Don, and Raph) next to their faces, and words like “Cowabunga!” and “Pizza! Yum!” on the bottom tier. This is awesome. So much work, I admire you for being so creative. Love it. Great Cake! What was the website where you found the TMNT font? thanks!